Meet Momma! She is a Great Dane/Pit Bull Terrier Mix. Momma has been a stray for a few years in Memphis, Tennessee. A good samaritan had gotten her spayed and kept her current on shots. The temperature was about to drop below freezing, so Momma was in need of a furever home. She is 65 lbs, good with other dogs but is a little shy. Momma was heart-worm positive, and was looking for fundraisers to help pay for her treatment. Momma was renamed Maya when she got to her new rescue. Maya was brought in by Sweet Strays Rescued in Memphis, Tennessee. The founder of Sweet Strays Rescued, Leslee, tries to catch strays she sees wondering the streets in Memphis. She also takes in owner surrenders so they will not end up on the streets like Maya. 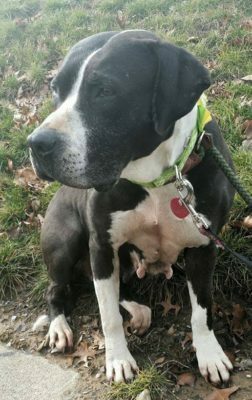 Sweet Strays Rescued found a shelter in Akron, Ohio willing to take Maya. It was a tough journey for Maya as she compiled a list of health issues. She was heart-worm positive, had a double ear infection and had a sinus arrhythmia. From Maya being a stray and running around the streets, she had abrasions and irritation between her toes. On top of that, Maya had a concern for a compound fracture in her right rear hock. While a series of tests were being done, she was healing with medication for her ears and feet. Although she was in the healing process, Maya still needed x-rays of her chest and rear leg. 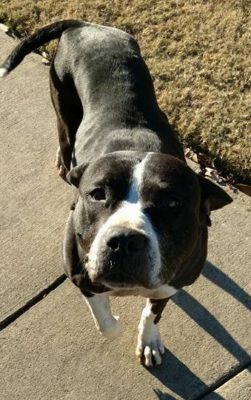 After a long journey and traveling over 700 miles, Maya made it to Akron, Ohio where she is at Uno’s Happy Ending Rescue. Thanks to the volunteers who were involved in Maya’s transport, she is now off the streets and is ready to find her furever home. To learn more about Sweet Strays Rescued check out their Facebook page here.